Another of our bold monochromatic designs, ‘Park Bench’ offers a simple yet romantic scene that will be sure to impress your clients this holiday season. Send one of eCO2 Greetings corporate holiday ecards from our impressive portfolio and wow your corporate recipients. A favourite amongst our customers, ‘Park Bench’ paints a bold picture of an inner city winter scene. Finding a place of tranquillity in the middle of town can often be a difficult task, but this park, seen here in the middle of the most beautiful snowfall, provides just that. 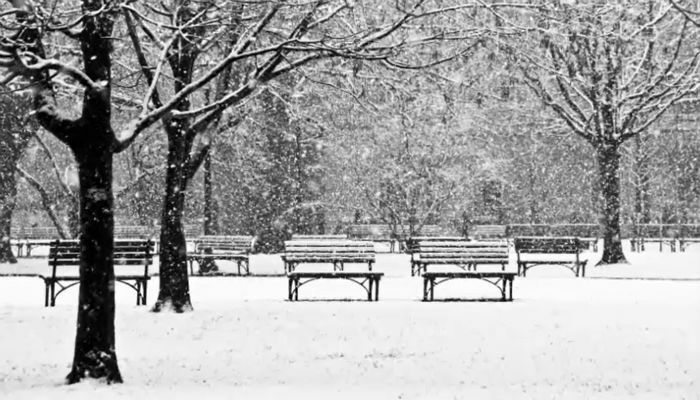 Centred in the image are empty park benches, just waiting for a couple to come and sit on them under the romance of falling snow. Tall, bare trees stand gently over the benches, blackened through the monochrome filter used to take this photograph. Snow falls gently through animated effects that further enhance the scene. Include a personal message on the front of this ecard in a red font to really make your words stand out to your chosen recipient. ‘Park Bench’ is a wonderful ecard that will give your clients a sense of the romance and wonder that the holiday season brings. If this isn’t what you’re looking for your business, we urge you to design your own using our range of electronic holiday cards for business.